The Bay’s own diverse character helped create its array of indigenous craft. Native Americans hewed and burned dugout canoes. Oystermen at the turn of the century needed boats that could hold tons of oysters and still fly to market to get the best price, so the sailing log canoe came into being. Bugeyes and then skipjacks evolved to dredge oysters, and buyboats were built to buy the catch on the spot, then carry it to market. Crabbers developed the Chesapeake Bay deadrise for their task while other builders created boats just for the fun of racing. Crab scrapes, pungy schooners, Potomac River dories, Hooper Island draketails, Smith Island netting skiffs are just some other examples of Bay vessels. The list is long, revealing the Bay’s own astonishing breadth. Boats are the Bay’s workhorses. Without them, there would be no watermen, no crabs on the table, no log canoes spreading sails against a bright blue sky. This tour lets visitors see traditional log canoes under sail, watch shipwrights teach boatbuilding skills, and take a cruise on a skipjack. 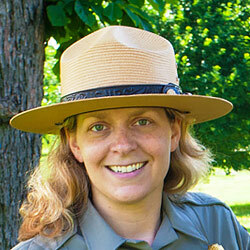 Kate is a visual information specialist at the National Park Service Chesapeake Bay office in Annapolis.